My house was constructed in the early 1950s. It’s an updated type of Chicago bungalow called an English Tudor, and while it looks pretty small on the outside it’s really quite big on the inside. On the first floor I have a small entry foyer, a large living room, a large dining room, a medium-sized kitchen, a full bathroom, and two bedrooms: a small one, and a medium-sized one. The first floor is where I’ve been living and sleeping since the fall of 2009. Before that, my ex-husband and I slept in a very large bedroom on the second floor. 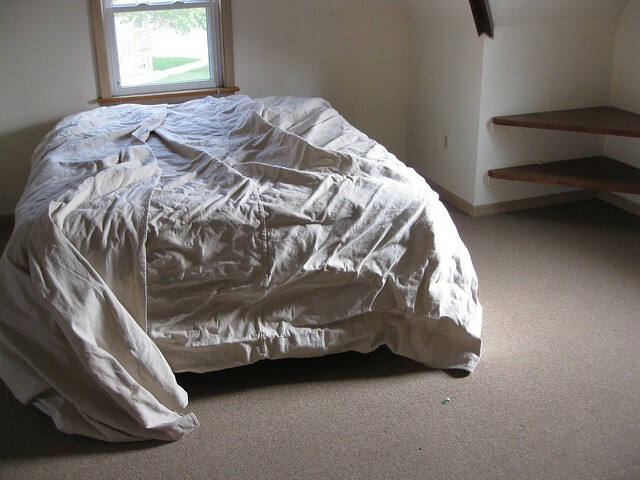 This was one of the bedrooms I began renting out after the divorce to bring in extra income. The second floor of the house also has a full bathroom that we had updated in 2005, a smaller bedroom with a walk out porch, and a lot of built-in storage and closets. The smaller bedroom had been “decoratively painted” by the previous owners of the house at some point. (I also rented this bedroom out and the two different guys who lived there over two years didn’t seem to mind that the room had a flower stenciled on the closet door.) Other than that bathroom update in 2005, however, the upstairs has remained untouched since I first moved into this house in 2001. Since I was divorced in 2009 and took over sole ownership of the house, I’ve used my tax refunds to do some sort of work on the house every year. In 2009 it was a kitchen remodel, in 2010 it was outdoor stuff (tree trimming and landscaping updates), and in 2011 it was a bunch of external/internal maintenance things (spot tuck pointing, internal wall repairs, as well as sewer rodding and cache basin cleaning). With this year’s tax refund, I decided to freshen up the second floor with new floor coverings, paint, and light fixtures. 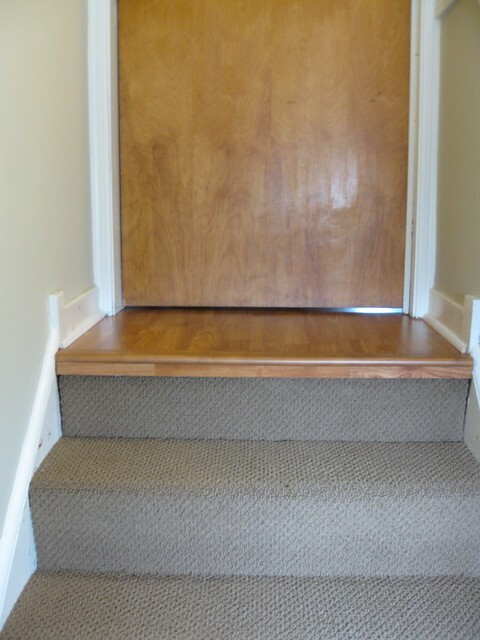 I also had the stairwell connecting all the floors in the house freshened up, too, with new carpeting and paint. Smaller bedroom before remodeling. Note the “decorative paint” and the stained carpet. 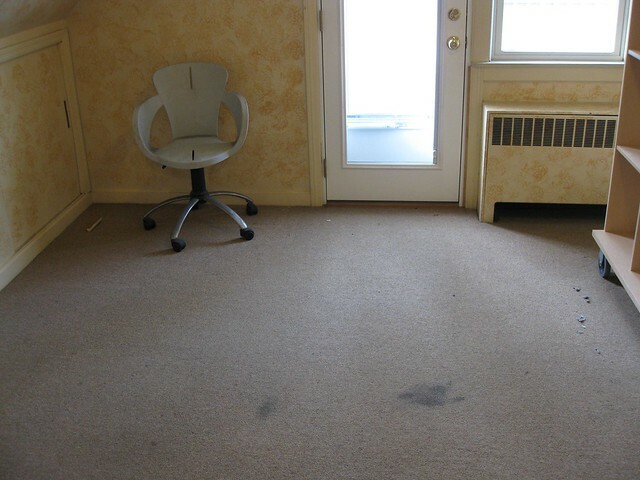 The first tenant messed the carpet up, but it wasn’t very pretty from the start. Fresh paint, new laminate floor, and new light fixture. Isn’t it amazing what some paint can do for a room? 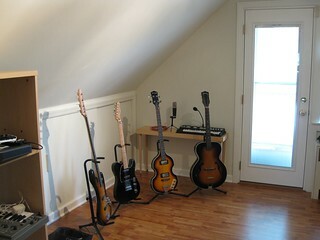 And here’s the real “after” on this room, now that B has it set up as his studio. Guitar row in the studio. 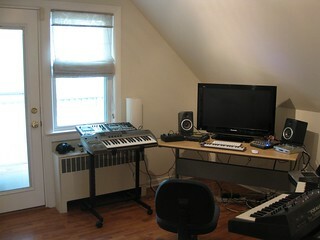 Production space for editing/mixing videos and music. The big bedroom presented a few challenges. There is some infrastructure in the room for the first floor heating (why they put radiant heat in the ceilings during the 1950s and not the floors is beyond me!) and the cooling system (a high velocity A/C system installed back in 2003). Before the refresh, this room had two small, built-in desks in the corners. One of the desks covered the heating pipes, while the other was there just for balance, I guess. The desks were installed in December 1967. I know this because one of them was dated and signed by the builder/original owner of the house, a contractor by the name of John H. Neil. How do I know that was his name? He put his name up in lots of places in the house. Like this one at the top of the stairwell. John Neil (J.H. 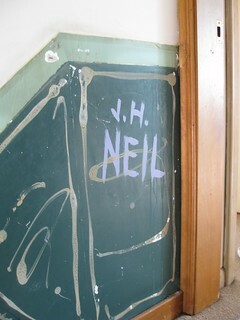 Neil) painted his initials on the wall before adhering paneling. 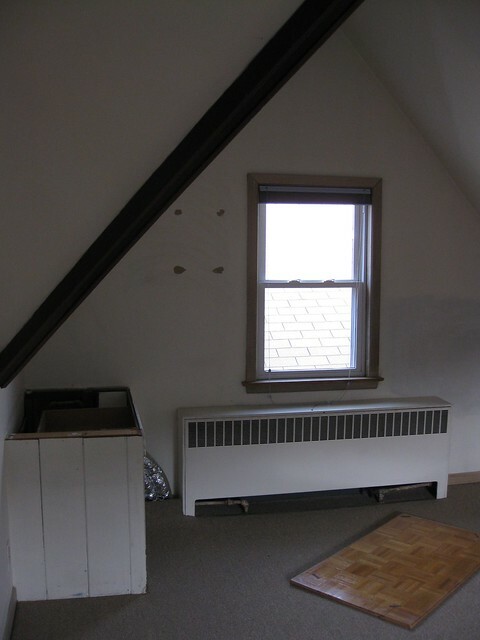 The same location with paneling and old carpet still in place. Despite his proclivity to slap his name on everything, I have nothing but fondness for John Neil. He built a solid house and raised five daughters here. The poor guy must have been frequently hounded to put the seat down. Maybe that’s why he put a bathroom on every floor of the house. Anyway, back to the big 2012 remodel. The big bedroom at the front of the house. Built in shelves at right are actually re-purposed doors. One of the built-in desks, added in 1967. This one covered the return line for the radiant heat. The silver “tubes” are A/C ducts for the first floor. 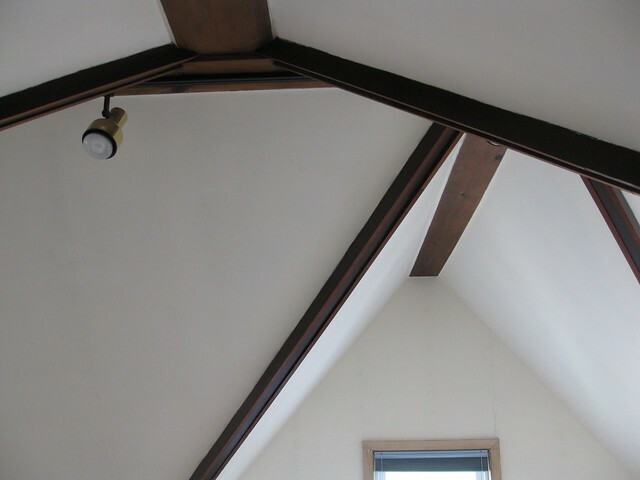 The ceiling in this bedroom is full of odd angles because it follows the peaked roof line. The dark stained wood accents were there when I moved in. Same room, different look. The shelves were removed to allow for more flexibility. I have to figure out a way to cover the pipes while still having them accessible for maintenance. 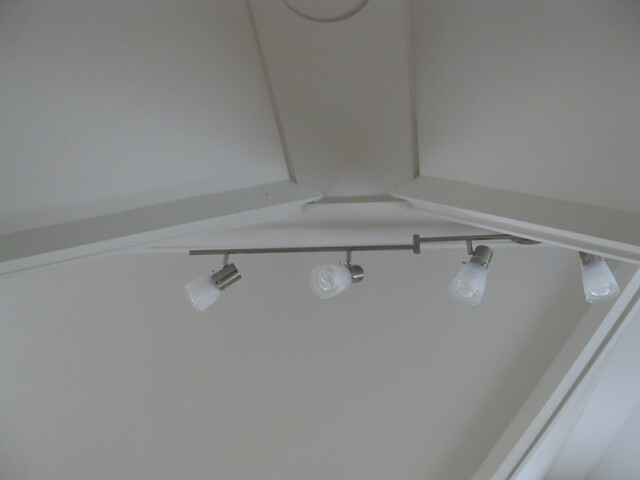 The dark wood was primed and painted to match the rest of the walls and the light fixture was updated. Oh, and that stairwell area signed by J.H. Neil? After the update it looked like this. 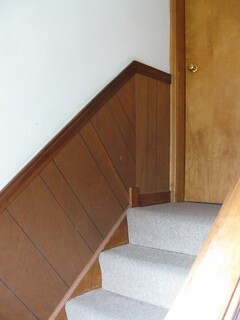 Stairwell after new carpet and paint. Touch up needed on the stringers, as they got a bit messed up from carpet install. Total cost of this refresh has cost $8,122 to date, and I’m still not completely done. That ended up being about $1,000 more than my combined state and federal tax refund this year. The hallway connecting the two bedrooms still needs to be painted, but I can do that myself. I just wouldn’t have been able to prep and paint the big bedroom and stairwell, with the soaring ceilings and crazy angles. Nor could I be sure to replace all the flooring with such skill. 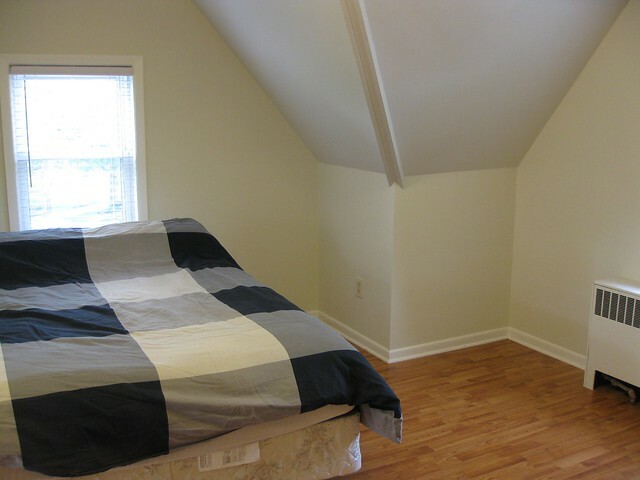 (Really, zoom in on that shot of the flooring placement around those mechanicals in the big bedroom. Those flooring guys did amazing work!) So I feel like this was money well spent. The hallway connecting the two bedrooms still needs to be painted, but that’s something I can do myself. I’ll need to pick up some more paint, so there will be a bit more cost involved besides my time, too. 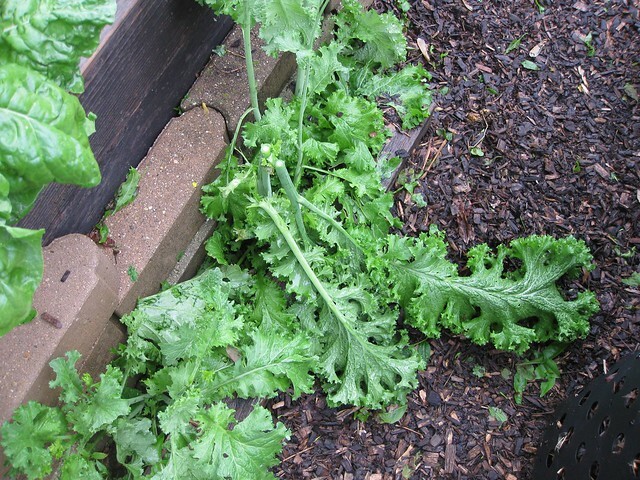 To view a slide show of all the before, during, and after photos I took, go here. So what do you think? Does it look good? 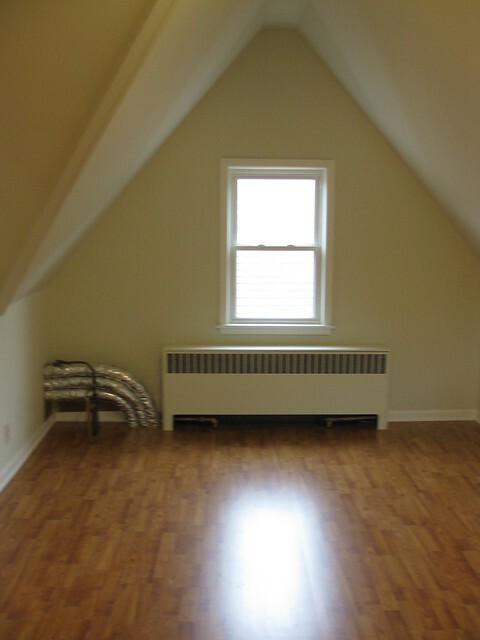 If you have any ideas for how to cover those pipes in the big bedroom, be sure to leave a comment! I’m thinking of fixing up that big bedroom like a hotel suite and renting it out through Airbnb; if you have any ideas on that, I welcome them, too. While unwinding after work today (and it was such a gorgeous evening to do so on the back porch, cocktail in hand), B brought my attention to a segment he heard today on our local public radio station, WBEZ. The segment was called “Why Have Children?” and included an interview with the author of a book examining the ethical issues involved in deciding to procreate. The summary included in the link above is very good, but listen to the segment if you have time as the calls were particularly interesting. There is a call from a man about how he and his wife have been considering this issue for some time and are still not sure, and the last call is from a woman who says she hears people tell her how selfish she is for not having children. While the author is surprised, I’m not. Although logically, really, if a person chooses not to procreate aren’t they really being selfless? Isn’t choosing to not produce another person to consume finite resources a decision that frees up those same resources for the offspring of others? Can’t that be called selfless or even altruistic? I can’t say that I put a lot of heavy thinking into my decision to be child-free. Although the fact that I choose to call my state of not having children to be one of freedom says something about my mindset, I think. I have several child-free friends, and I think some of them do wish they could have/would have made children at some point in their lives. But not me. For many people, there seems to be some thoughtlessness that goes along with procreating. Even the author comments on this in her interview. “It’s natural,” or “it’s the next step after marriage,” seems to be the cultural norm most of us face. I actually did face this assumption in my twenties. I hadn’t gotten married yet, but I thought that I would do so and just have kids since that’s what we’re biologically optimized to do. But at 30, when I finally did make plans to be married I talked to my soon-to-be husband about the fact that I didn’t really think I wanted to have kids ever, and he was OK with that. I can’t really put my finger on one single reason why I didn’t want to reproduce because there seemed to be many reasons: I doubted my ability as a parent; I was concerned about the costs of raising a child or children; I had reservations about adding to the population of an already over-populated planet; I felt like I had a lot of personal development ahead of me that would be interrupted by the addition of a child or children. For six years of marriage I continued my hormonal birth control and then I finally decided I should stop the drugs. I still didn’t want kids, though, and husband concurred. So I asked him to get a vasectomy. He balked. I said I’d get a tubal ligation, and he urged against it. He said it was not because he wanted children, but because he didn’t want me to have unnecessary surgery. Turns out he was probably right about that, as I could have gotten an IUD instead if I had just seen another OB/GYN. The one I had at the time was very discouraging of it and said she couldn’t guarantee the insertion would work since I was “nulliparous.” She was also highly doubtful when I said I wanted to have a tubal ligation. I should have been insulted when she insisted that she meet and talk with my husband first before she would perform the procedure. I was certainly incredulous that in 21st century Chicago I had to jump through so many hoops to get surgically sterilized when I was “only 36 years old.” I was counseled that if I ever did want to have children I’d have to use IVF, and I thought, “Yeah, me and pretty much every other 36+ year old female will need to use a lab to get pregnant these days; no surprise there.” But the fact that as an adult woman I had to get my husband’s approval first…damn, that amazes me now, nearly 10 years later. I’ve never regretted my decision to have the tubal ligation, by the way. (Not even when an accident during surgery — oops, we perforated your uterus, sorry! — turned an out-patient procedure into an overnight hospital stay.) I’m glad I took the surgery route back before women’s access to birth control was being challenged, like it is now. I’ve never wanted IVF or to adopt or foster children. I’m perfectly happy being an aunt to one niece and one nephew, and having lots of friends (including an awesome guy like B!) who are child-free like me. And I’m not selfish, just practical and realistic. Or at least that’s what I think.